Connecting with customers and gaining authority in a niche industry can be difficult. 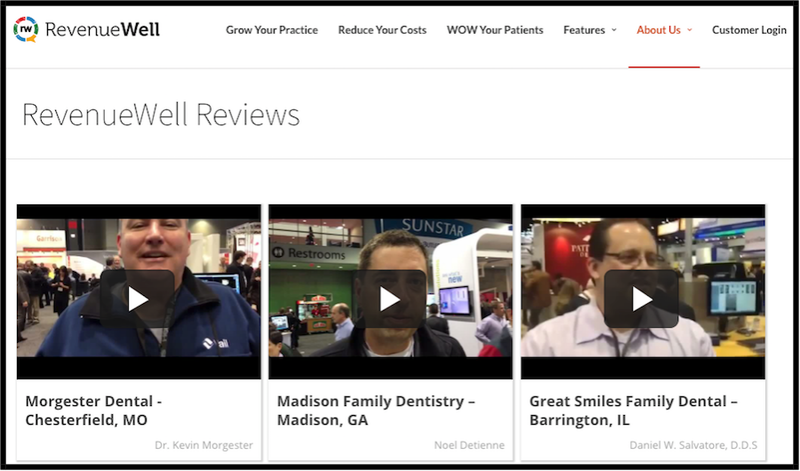 RevenueWell, a customer communication platform for dental practices, took on this challenge by leveraging the power of testimonials and collecting video testimonials at trade shows. RevenueWell, like other industry-specific tools, understood the importance of trade shows as a pivotal networking tool. Using Boast at their industry conferences, they were able to reconnect with customers and build authority through video testimonials. RevenueWell has successfully captured dozens of written testimonials with images, but getting video testimonials was more of a challenge. Realizing the power of video, RevenueWell decided to connect with users at an upcoming conference and ask them about their experience using the platform. Speaking face-to-face with users in this environment made it easier to gather video testimonials at trade shows in a number of ways. To speak with prospective customers and make valuable connections, RevenueWell already attended a number of conferences and industry events for dental professionals. At these events, they also reconnected with users from all over the country. This created the perfect space to gather high-impact video testimonials. If your business relies heavily on trade events, consider using this strategy at your own industry conferences to get more video testimonials. Here are a few reasons why it works so well. RevenueWell is all about saving dentists and office managers time. The platform is designed to automate activities like billing, confirming appointments, and sending reminders. Understanding that dental professionals already have many demands on their time, conferences provided an easy and time-saving way to connect with users and ask for a testimonial. It’s often difficult for happy customers to find the right words for a written review, and video testimonials are even harder. RevenueWell was able to speak with customers at the conference directly to make them more comfortable. These conversations about their experience using RevenueWell then made a natural segue into a video testimonial. Question prompts like “What’s your favorite part of RevenueWell?” made quick video testimonials at trade shows comfortable and manageable. Testimonials that seem like TV commercials tend to be less impactful, because they’re seen as less genuine. By reaching out to customers at a trade show, RevenueWell was able to get spontaneous responses and users were encouraged to just be themselves. Some preferred more rehearsed responses, others more impromptu, but this variety adds to the trustworthiness of the testimonials. Asking for a video testimonial first means asking about the user’s experience with the platform, and if they have any concerns or changes. This attention not only keep the platform dynamic and ensures customers needs are being met, but also ensures that customers feel appreciated and listened to. The number one goal of trade shows and conferences is to reach out to new customers and showcase the RevenueWell platform. By building trust and customer confidence, this is ultimately the goal of testimonials as well. In this way, collecting video testimonials at trade shows provides two advantages. RevenueWell is able to connect easily and directly with current customers, but new customers can also hear the high praise in real time. Asking permission to use testimonials and ensuring users know how their reviews will be used is an important part of using testimonials lawfully. This is also an important part of maintaining positive relationships with customers. By talking directly to customers at the conference, RevenueWell could provide all the details up front. If conferences and trade events are an important part of your marketing strategy, get the most out of these events with video testimonials. Using Boast, you can collect and post video testimonials at trade shows or from anywhere else, and showcase them on your site with just a few clicks. You can even automate this process with ease, including scheduled emails to tell your customers where they can find you, and follow-up thank you emails. With this strategy, you can quickly and easily build more authority in your industry and maximize the value of a exceptional customer experience.